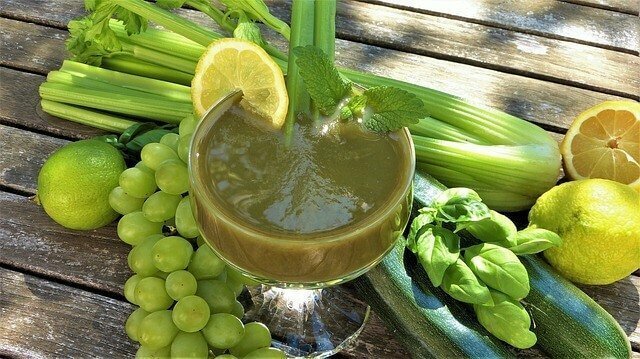 I had started drinking green smoothies a glassful every day since my early college days. Back then, I had blended any leafy green with a dash of lime and salt and gulped it down in a quarter second. My mother and my best friend Preeti were witnesses to this madness but supported me anyway because good things deliver good even if they taste awful. But truth be told I couldn’t go on with the pungent drink. Particularly after life handed me over to a husband, I wanted to cook the most delicious meals that were healthy too. Thankfully, my husband has been mostly on board with all of it. Whether I cook up a three bean chili or a best of the season’s sweet potato Indian curry, he scarfs it down without complaint. I’d say he even enjoys it. Until that is, I started putting a green colored drink in front of him right after breakfast. He looked at me, eyebrows raised, a steady questioning eye contact as he took his first gulp. “Yikes”, I almost thought I heard it. Oh man, I thought. He doesn’t like it. “It’s pretty good,” were his exact words. So began my quest to get that reaction as often as I could. 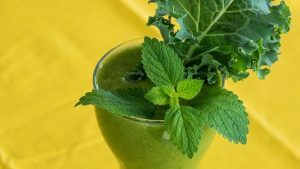 After months of throwing almost all the green contents of my refrigerator into the blender, I’ve come up with five solid green smoothie recipes that I know taste good to even the green drinking averse. Each of these green smoothies serves two people. Are a powerhouse of nutrients in a glass. They will help you lose weight faster and contribute substantially to your overall wellness. Try them all and you’ll understand why they are so popular. 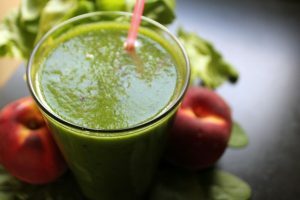 Blenders or Smoothie makers – It helps to have a good quality blender when making a smoothie, especially when making green smoothies. 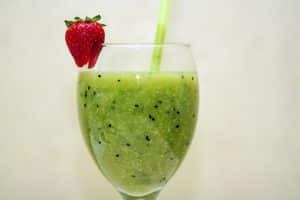 Hand blenders can work for the simpler fruit smoothies but will be no match for the higher spec ones. Gold standard blenders would be a Vitamix or Blendtec these are the ones used in Starbucks and the like. Before I go into what the best recommendations are for green smoothies, I thought I would give my tips on how to have the best experience with blending up your greens. Blend your greens FIRST. 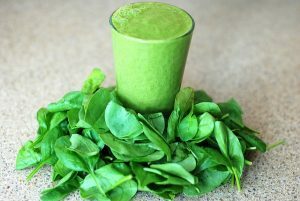 Put all the lettuce or celery or cucumber and spinach in the blender with a cup full of water or your liquid of choice and blend the crap out of it until you can’t see any little bits. I also like to chop up the lettuce or other greens before whisking them away into the blender. I have no idea whether or not this makes a difference, but it makes me feel better. Put all the ingredients in a blender. Blend for 1 minute and transfer to a glass. 5 stalks spinach or kale (stems removed). Put all the ingredients in a blender. Blend for 1 minute or until smooth. Pour into a glass and serve immediately. Whizz em’ up and you are out of the door in minutes, ready to face the day. Here’s the ultimate pick-me-up for when you feel a cold coming on. This juice is packed full of vitamin C in its strongest and purest form. Put all the ingredients in a blender and blend until smooth and creamy. Add water to achieve the desired consistency. I have discovered berries can mask the taste of almost every green that you might want to throw into the blender. You may add strawberries or just any other berry of your choice just remember to throw in a generous handful. Green foods are considered super-foods because they contain a high amount of antioxidants, plenty of vitamin C (136% DV! ), and essential phytonutrients for detoxification. I love green smoothies and have them been taking them every day for a week now. With lunch being my biggest meal of the day. I am amazed! My skin looks better, I’ve definitely lost weight. I feel lighter overall. Which one’s the best smoothie among these? Share your experiences in the comment box or share your own favorite green smoothie recipe. Green leaf smoothies are simply miraculous. Give them a try and you are in for a surprise. At the beginning, I had gotten irritated at my daughter’s messy job, but 15 days later, I noticed a distinct shine on her hair which was pretty dry and colorless before. Only this time the smoothies are a prettier version of what I had originally started off with. Just amazing…….its time to try ‘em all….. Yes, you should try them all to understand which one you like best. I am a regular visitor of your website. Simply awesome! Extremely useful articles.